Don’t let “small value” fool you. If you can stomach a bit of risk, these stocks can more than pull their weight. Consult history. See the following figure, which shows where small value fits into the investment style grid. Small value stocks are important in a poised-for-performance ETF portfolio. 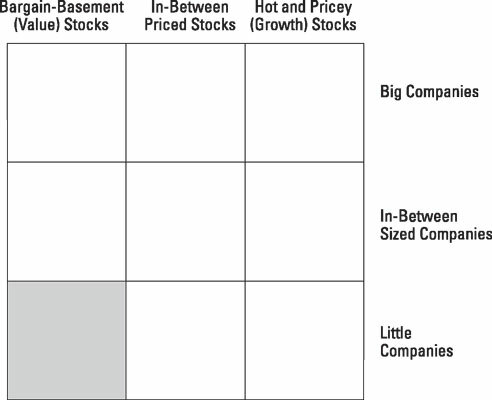 Small value stocks occupy the southwest corner of the investment style grid. Small value stocks collectively have returned more to investors than have large value stocks or any kind of growth stocks. In fact, the difference in returns has been somewhat staggering: an annualized return of about 15 percent over the past 20 years for small value versus 11.6 percent for large value, 11.5 for large growth, and 10.7 for small growth. Compounded over time, the outperformance of small value stocks has been HUGE. What are small value stocks? Some of the top holdings of the Vanguard Small-Cap Value ETF (VBR) include Snap-on Inc, Alaska Air, Gannett Co, Rite Aid, and Arthur J Gallagher & Co. Face it, there is not much excitement to be seen in companies such as Snap-on Inc. (Snap-on Inc manufactures and markets tools, equipment, diagnostics, and repair information and systems solutions for professional users worldwide.) And most of these companies aren’t growing very fast. As you go farther down the list of holdings, you’ll likely find some companies in financial distress. Others may be facing serious lawsuits, expiration of patents, or labor unrest. Welcome to the world of small value investing!